Steven Stratton has been riding since childhood and has had the advantage of an exceptional education in the theory and practice of classical horsemanship. The US Pony Club shaped his early years where he had the honor to work with many well-respected educators in the discipline of Three-Day Eventing. Among them was Jim Graham, who later went on to ride and medal in the Atlanta Olympic Games. Throughout his teen years Steven was a working student for Ms. Ann Ticehurst, BHSI and R level judge at the High Halden Dressage and Combine Training Center. There he also studied with Michael Handler of the Spanish Riding School. 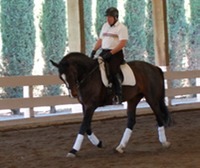 Steven continued on to compete at the National and International levels in Three-Day Eventing and Dressage. As an instructor Steven provides riding lessons that emphasize safety and correctness, as well as effective communication with the horse. 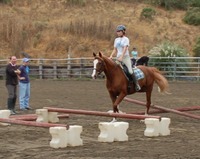 Steven’s lessons are geared toward the individual needs of each team, whether their goal is competition or trail riding. 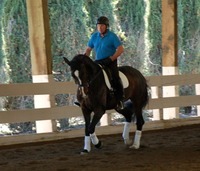 As a trainer Steven excels at helping hone each horse’s natural abilities. He works patiently to build solid foundations and his decades of experience on all types of horses, from green through highly trained competition horses, give him the wealth of knowledge needed to bring out the very best in you and your horse. Chrystal’s passion for horses started at a very young age. At age six she began western riding lessons and trained in that discipline for six years. At age twelve she moved to English riding and took both English riding instruction and stadium jumping lessons. She began training with Steven Stratton in 2008 and has become an accomplished rider/instructor who understands horses, their personalities, and is especially mindful of the rider’s needs and goals. Currently, Chrystal is assisting Steven with his riding program and teaching many of his beginning students as well as taking over his more advanced clients in his absence. Chrystal is exceptionally proficient with children and has a background in Early Childhood Education.